The Shuswap Watershed Council wants the Shuswap to be a safe place for people to play. That is why we are reaching out through public education campaigns focused on safety in water recreation. This is especially important for issues that are unique to the Shuswap, and for issues of which there is little public awareness. Whether boating, floating, towing, paddling or SUPing, wear a lifejacket or PFD. Have a sober skipper! Never boat under the influence of alcohol or drugs. Be prepared for every outing on the water. Check your pre-departure checklist. Be extra cautious around cold water, such as in early summer or diving more than a few feet below the surface. Cold water can disable you from re-surfacing. Always use a spotter for tow sports. Watch for floating and partially sub-merged debris. The Shuswap is surrounded by forest, and logs and other debris may be in the water at all times of year. Watch - don't just listen - for trouble in the water. Don't be distracted while supervising children. Did you know that drowning victims are usually silent? All of their energy and focus is put into staying afloat, not calling for help. That is why it's so important to always watch – not listen – when you are there to supervise swimmers. Here's an article on how to watch for signs of drowning: Getting to Know "Silent Drowning." You can borrow a lifejacket for a child free of charge from a “Kids Don’t Float” Personal Flotation Device (PFD) loaner station, provided by the Royal Canadian Marine Search and Rescue (RCM-SAR), Station 106 Shuswap. The Shuswap Watershed Council is pleased to support this great initiative by providing two contributions of $1,200 each to RCM-SAR Station 106. 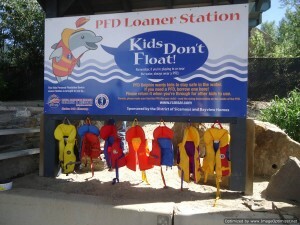 The funds support PFD loaner stations at the Salmon Arm Downtown boat launch and Sunnybrae Community Park. Thanks to RCM-SAR and many community donors, there are now 12 loaner stations in the Shuswap, and a 13th will be built soon. See the Map of "Kids Don't Float" Lifejacket Kiosks. Research from the Canadian Red Cross — our country’s leading agency on water safety and education — shows that over 87% of those who died from drowning (1991-2000) were not wearing a lifejacket or personal flotation device (PFD) at the time, or did not have the device properly secured. Children aged 1-4 years are among those at greatest risk. 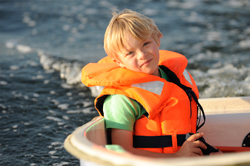 Ensure your child’s lifejacket fits snugly, and is properly secured every time you head out on the water. Here are 7 tips for having fun and staying safe, in quick-to-download format. Keep it handy on your phone. 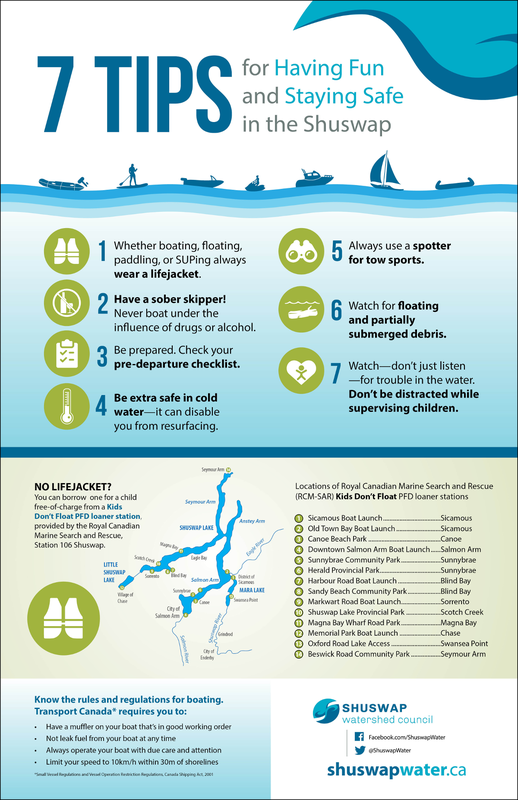 Download the Royal Canadian Marine Search and Rescue (RCM-SAR) Safe Boating app for iPhone or Android. 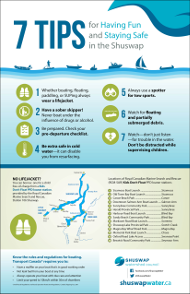 You'll find boating equipment requirements, helpful checklists, VHF radio channels, and more. Check it out!